The US has always been known as the world’s largest exporter of soybeans and corn. Although upholding that title, two South American countries have made significant end roads in recent years, becoming a strong competitor to these two major US markets. Argentina and Brazil have become major players regarding world soybean and corn supply. This arguably rapid growth makes it difficult for the US to advance as a major export market. In this series, we will take a quick look at the characteristics of these two countries and why they are such an integral part of world supply and demand. Along with other crops, both Argentina and Brazil produce soybeans and corn annually. Different locations and land mass limit how much is grown in each country making them slightly different from the other. Argentina is the world’s 3rd largest exporter of soybeans and 2nd largest exporter of corn while Brazil is the world’s 2nd largest exporter of soybeans and 3rd largest exporter of corn. Land mass in the US is nearly maxed out, thus limiting the expansion of increased farmland and capping annual production. Genetically Modified Corn (GMO) is the next step in increasing the trend of production in the US. Conversely, South America still has land that could be converted into farmland, which could continue to increase annual production. The significance of knowing when the growing seasons occur in South America are just as important as knowing when they occur in the US. Traders will pay close attention to these two countries to help them determine where supply may be after harvest. The US growing season is typically shorter than in South America due to the higher latitudes of the U.S. Corn Belt. The US Corn Belt has an average growing season of 4 ½ months while the southern US experiences a longer growing season of 7 months. However, Argentina experiences an 8 â€“ 9 month growing season for soybeans and corn. One of the most notable and major differences between the US and South American growing seasons is the planting season of “Safrinha” corn that is planted mainly in the Center-West region of Brazil. It is typically planted in February and is harvested through June. This “winter” corn is able to grow during this time of year due to the more tropical climate that this region possesses. Recently, there have been more efforts to expand Safrinha corn into Brazil’s “South”, specifically in the Parana region. A region’s agro-climatic setting surrounds the physical characteristics of its climate and what natural resources lie within. Characteristics of an agro-climatic setting include: growing season, temperature, day length, sunlight, elevation, etc. These factors determine not only what crops may grow there, but also determines their yield. The US lies within a temperate zone. A temperate zone is defined as parts of the earth’s surface lying between the Arctic Circle and the Tropic of Cancer and between the Antarctic Circle and the Tropic of Capricorn. The Corn Belt is a primary example of a specific agro-climatic region. The features that lie within this area help produce the best yielding soybean and corn crops in the whole US. Other areas such as the hot and humid Southeastern US make perfect conditions for growing cotton. In the Central region, Argentina possesses a temperate climate similar to the growing regions in the US. The majority of row crops in Argentina are grown in the Central to Northeastern third of the country. Soybeans are grown in the more northern regions due to its warm humid temperatures and fertile soils. Corn is grown in the more central regions. The main areas that dominate row crop production are Buenos Aires, Cordoba, Santa Fe, and western Entre Rios. Over 90 percent of soybean production and 80â€“90 percent of corn production takes place in these regions on the fertile Pampas. 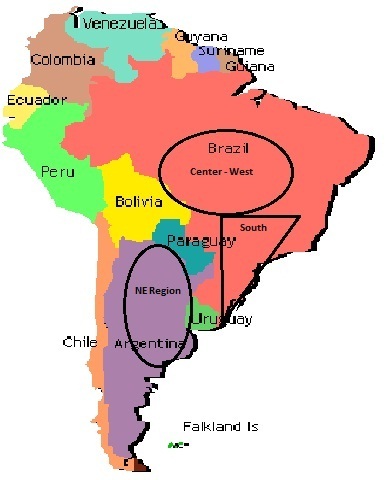 Agricultural production in Brazil is separated into two separate regions, the South and the Center-West. Brazil’s “South” possesses nearly the same humid climate as NE Argentina. Brazil’s South has been one of the world’s most productive agricultural zones for decades. One of the greatest benefits to agricultural production in these regions is the close proximity to ports on the coast, which provide easy access to markets. States within this region include Rio Grande do Sul, Santa Catarina, and Parana. The “Center-West” region of Brazil began its development into Agriculture in the 1960’s, due mostly in part to government incentives. Since then, it has grown to be a major agricultural area that rivals the South as the main region for agricultural production in Brazil. This region lies in a humid tropical zone. Due to a different climate than the south, different varieties of crops have been added to tolerate the shorter days and tropical temperatures. Because of its location, the Center-West region was limited to markets due to it inaccessibility to three major ports. The states that lie within the Center-West region are Mato Grosso, Mato Grosso do Sul, Goias, and the Federal District surrounding Brazilia. Soybean production is divided evenly between the South and Center-West while corn production is widespread throughout both regions. Exports and international competitiveness can be extremely limited due to poor infrastructure. The US is the world’s largest exporter of goods because of its outstanding transportation network. The Mississippi River and its tributaries are the main link allowing goods to move into international markets with ease and efficiency. Contrary to the US, Argentina and Brazil have a less developed infrastructure system, which creates higher costs and less efficient movement of product to the market. The US has a more developed rail and barge system that cuts cost for movement of product to a market. A lack in paved roads in Argentina and Brazil also make transportation from the farm slow, costly, and difficult. Farms in the US have ways of storing grain which allows them to sell when the price is right. Conversely, due to a lack in storage, Argentine and Brazilian farmers are forced to sell their grain at harvest when the price is typically lower. This also slows down the logistics due to crowded ports and offloading areas at harvest time. Although logistics have been an issue in the past, there is great potential in both countries for drastic improvement in transportation from farm to market. Brazil has the Amazon River, the world’s largest river system, and its tributaries, which have begun development to open up Brazil’s interior agricultural areas. Argentina also has the Parana-Paraguay River system located close to the major growing areas of the region. Policy changes and further investment in these areas will likely continue to improve what once was a logistical nightmare. Food demand across the world is increasing at a rapid rate as the population continues to rise. As other areas of the world have limited land mass that could be converted into farmland, the countries of Brazil and Argentina have the potential to continue growing as an agricultural powerhouse. This growth is necessary to meet the food needs of the world in the coming years. As these countries grow and improve their ability to move products to other importing countries, the US will have to remain competitive to maintain their title. To stay on top of crop production in Argentina, refer to the USDA — more specifically, refer to the monthly USDA supply and demand reports.